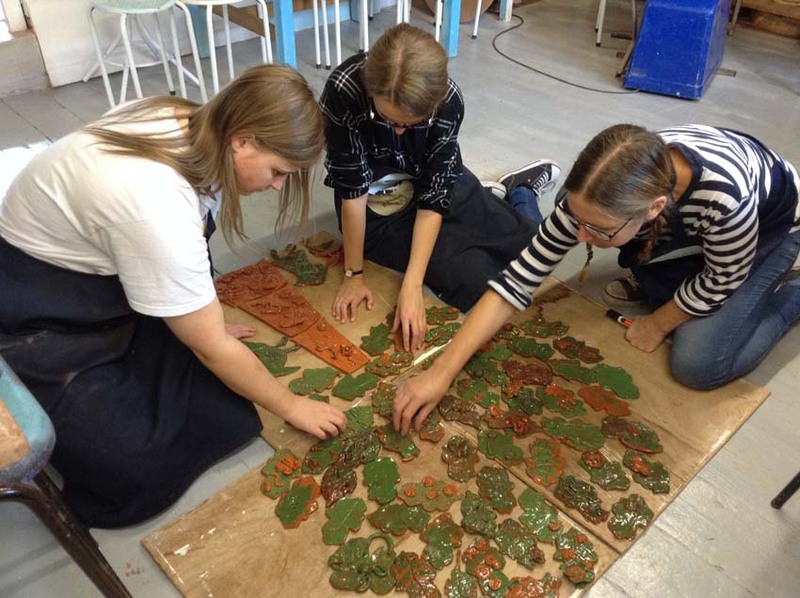 Our lovely community arts apprentices Aimme and Immy working with Sarah on the final touches of a stunning tile panel made by children, parents and staff at Washwood Heath Nursery School in Birmingham. Although the practical sessions are of paramount importance and integral to our practice, it’s worth pointing out the value of preparation and after-care we attach to every project. We reckon for every minute spent working with somebody hands-on, there is at least a minute of preparation and after-care. This collaboration will be hung on the outside wall of the new Clover Lea Annex building designed for the provision of the under 2’s. 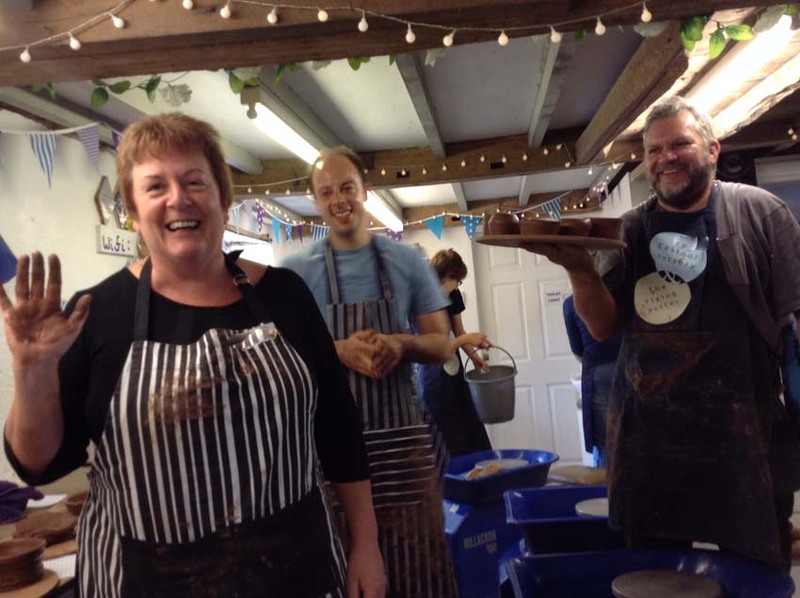 We’ve entertained a few WI groups at the Pottery recently. Groups of 10 or 12 women have visited the studio in the Autumnal gloom to get creative with clay. 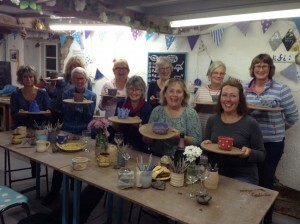 These ladies from West Malvern WI were the latest group to visit on Wednesday evening to make coil pots and each take a turn on the potter’s wheel. Most of them had never experienced the potter’s wheel or even touched clay since leaving school. 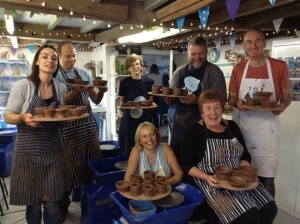 They had a great time and were positively beaming at their pottery achievements. Well done ladies! 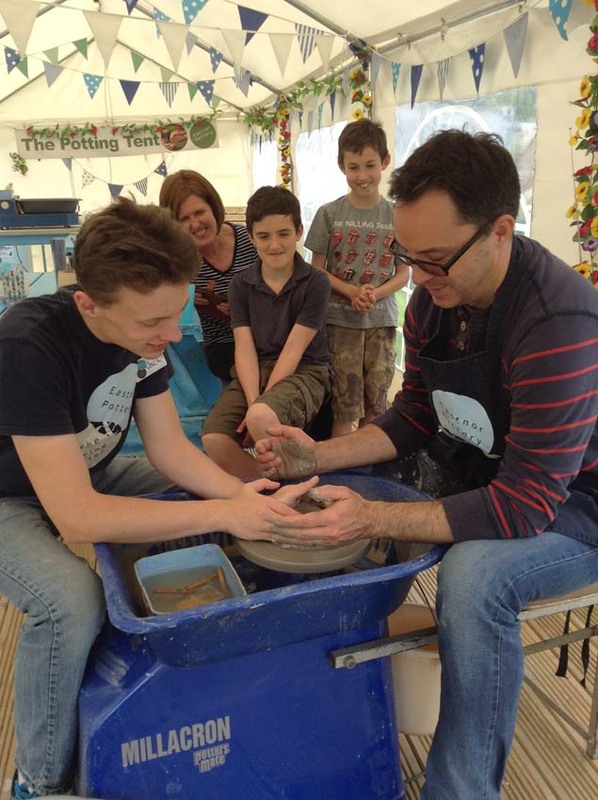 There’s nothing quite like throwing pots on the potter’s wheel to bring people together. We enjoy the way complete strangers bond and forge relationships with each other on our weekend and one day workshops. Participants form a creative and supportive community and although, by its very nature a transient one, the workshops are always a joy and a life affirming environment in which to work. New girls on the block! Introducing Aimee & Immy – our brand new Community Arts Apprentices who came to us via Creative Alliance and started their clay journey last week. “My name is Aimee. 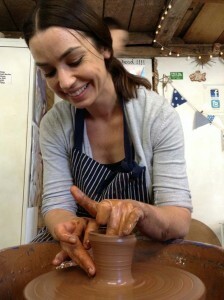 I am currently an Apprentice at Eastnor Pottery studying Level 3 Community Arts. I have been interested in the arty/creative world for as long as I can remember. My first inspiration into Art was my Year 7 Art Teacher. This had lead me to studying Art Textiles at GCSE in High School, A Level Fine Art in Sixth Form and a Foundation Diploma at Hereford College of Arts. In my own personal practice, I am interested in the fine art side where I particularly like to paint and draw. 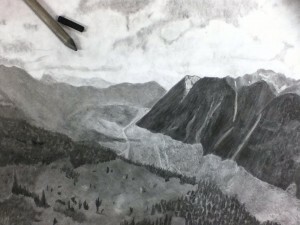 I find that the main subject I work from is landscapes, particularly the mountainous and coastal types. I am also interested in embroidery and have recently picked up a new technique called cross stitch which I have found to enjoy. I am also interested in politics and the local community which lead me to become a Parish Councillor in the area of Hereford I live. A new interest is travel as I enjoy exploring new places, taking photos and a sketchbook to document my trip and experiences. “Hi, I’m Immy. 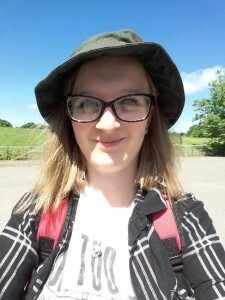 I am 18 years old and have recently started my apprenticeships at Eastnor Pottery. 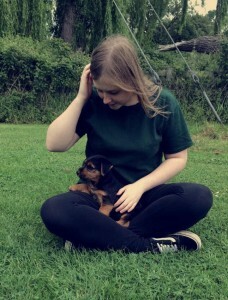 Until I started at the pottery most of my time was taken up by a small Jack Russell puppy named Barney, who destroys his toys quicker than I can by them and is otherwise known as biting Barney! I live with my parents just outside Upton Upon Severn. Upton is best known for its summer festivals, thankfully I live just far enough away for them not be annoying. 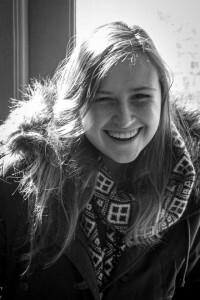 I studied A-Level photography at sixth form, and I got really interested in the subject. This fitted in with travel, something else I enjoy. I was lucky enough to go on school art trips to Barcelona and New York where I was able to see a lot of different types of art I wouldn’t have otherwise had the chance to. I think this influenced by style of photography. I was really pleased when a collection of my photographs were chosen to be displayed in the main entrance of my school. http://eastnorpottery.co.uk/wp-content/uploads/2019/03/eastnor_pottery_header_2019-3.png 0 0 admin http://eastnorpottery.co.uk/wp-content/uploads/2019/03/eastnor_pottery_header_2019-3.png admin2017-09-19 19:43:542017-09-19 19:43:54New girls on the block! We’ve teamed up again with those lovely people at Creative Alliance to offer an exciting job opportunity. We are looking for a motivated and enthusiastic individual to join our small but perfectly formed creative business as a Community Arts Apprentice. You will be assisting in educational workshops in schools, community settings and here at the studio. You will be given full, on the job training in pottery techniques including the potter’s wheel, eventually being able to instruct our customers and workshop participants. The role will also require you to assist in a range of other duties including; helping with glazing, packing kilns, general office administration and gardening. Both our previous apprentices have gone on to secure full time and part time employment with us having completed their one year apprenticeship. 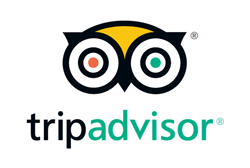 Don’t delay – apply here! 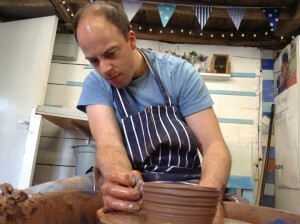 http://eastnorpottery.co.uk/wp-content/uploads/2019/03/eastnor_pottery_header_2019-3.png 0 0 admin http://eastnorpottery.co.uk/wp-content/uploads/2019/03/eastnor_pottery_header_2019-3.png admin2017-06-15 14:33:182017-06-15 14:33:18We're hiring again!